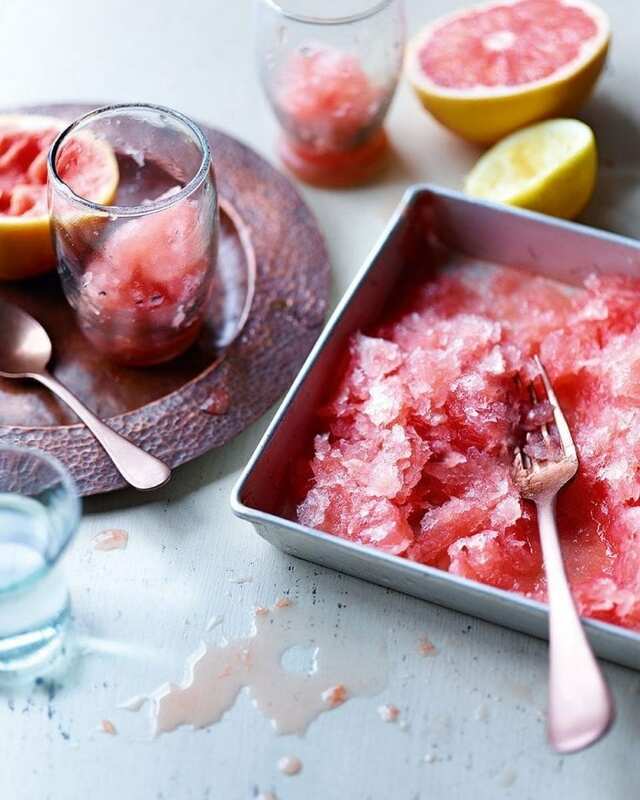 Valentine Warner’s boozy granita made from Campari and fresh ruby grapefruit juice is a quick and effortless dinner party dessert that’s guaranteed to please. Stir the grapefruit juice, Campari, lemon juice and sugar together in a large measuring jug or bowl until the sugar has totally dissolved, then strain the mix into a freezerproof container. Put on the lid and pop it into the freezer for 2 hours. Scrape the mixture with a fork to mix it up a little, then freeze again.Repeat 2-3 times every 1–2 hours until the granita has a light, snow- like consistency. Spoon the granita into chilled glasses and serve immediately with a good sipping gin at room temperature. Make up to 48 hours ahead. If it sets too hard, take it out of the freezer until it softens slightly, then scrape it up with a fork to loosen it. Refreeze briefly.